I took yesterday as a sick day. Maybe it was more a mental health day? I kept things running by email, but didn't look anything up and mostly let my staff fend for themselves. I was so tired--again! But this time I think I let the weekend overwhelm me. I did a 20 mile bike ride on Saturday--then spent the rest of the day puttering around the house. On Sunday, I did my volunteer thing again--it's for a bike co-op and I help people fix their bikes. It's really satisfying. But it meant I was outside from around 10:30-2:00pm, perspiring freely. I think I was dehydrated and that's why I was so tired. Maybe? Whatever it was, I don't care. Staying home yesterday felt so good. I was really lazy and just knit and watched tv all day. Perfect. I did go out for a walk in the early evening. The wind was coming up and the sky was lovely. I walked slowly and marveled at all the people out on my local business street. It's just unbelievable. A Monday night, bars and restaurants well-populated, lots of foot traffic...this place is almost unrecognizable. 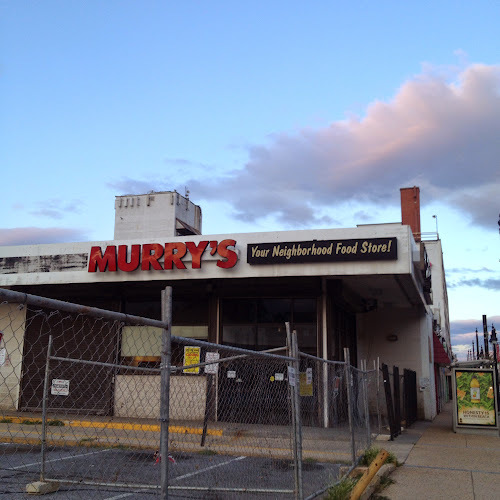 Murry's is part of the old neighborhood. Shut down, slated for demolition. And what's going to replace it? A Whole Foods. Madness. But really, look at that sky! Today I had my last PT session. It's almost one year (July 31) since my knee surgery. I'm basically 100%. I have exercises I'm supposed to keep up with. I'm going to be good, I promise, even though last week was a dead loss. I'm supposed to go back in a couple of months for a check in, but basically I'm done. My knees sometimes hurt, but it's the old aches and pains, in both knees. My muscles are rebuilt, I"m able to do any activity I like, it's really all good. Amazing. So, body is good. Work is good. Now I just have to figure out what I want out of life. Oh that little thing. It's a shawl but will I wear it? I don't know. 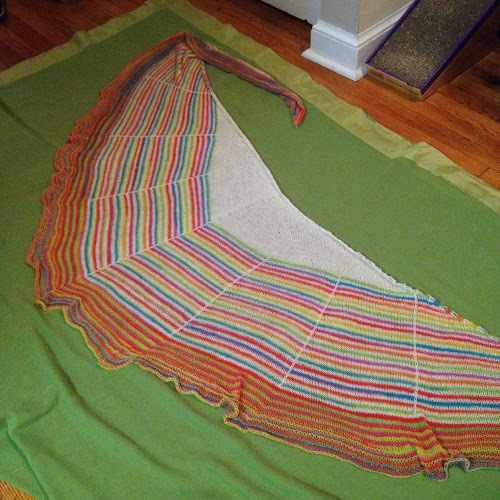 I picked up the "rainbow" yarn in a swap so it cost nothing. I had the white/cream hanging around. I felt compelled to knit it even though I don't know if it will be for me or someone else. Sometimes I have to knit something and its true recipient is revealed later. It was fun to make. Anything with color changes is. I'm working on a few other things at the moment--socks for one niece, socks for Mom, a lace shawl (don't know who that's for either, but probably me), and pair of colorwork fingerless mitts--definitely for me! If it weren't for the knitting, I'd probably be at my wits end. Or blogging a lot more? Grateful for: a hobby I love.